Share the information about fiber optic networking. 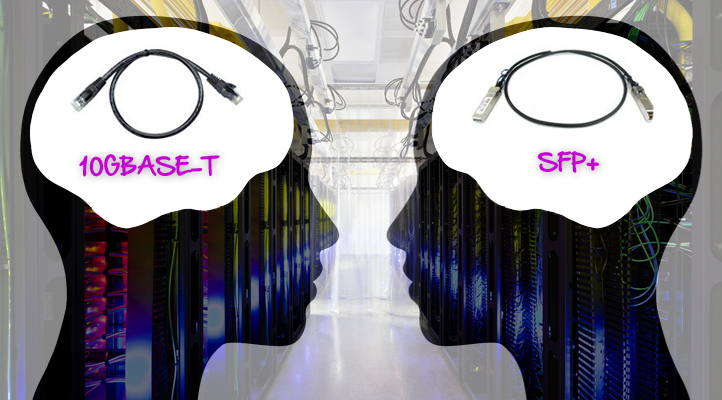 When it comes to 10G network, we usually make a choice between 10GBASE-T cabling and 10G SFP+ cabling. In fact, many people still prefer 10G SFP+ cabling that uses SFP+ DAC cable, because they think it matches better for the requirements and emerging trends of today’s data center. Now the 10G network is quickly becoming mainstream, especially on consumer desktop systems. That means the cost of 10GBase-T switches will need to come down. Also, other “IOT” home components that decide to offer 10G will probably go for 10GBASE-T, such as game consoles, streaming boxes, etc. So, do you still recommend 10G SFP+ over 10GBASE-T nowadays for network deployment? This article will discuss this topic. The 10GBASE-T ports are physically smaller which is important for non-data center devices. They are also easier to use. You just plug in an ethernet cable and it works. No need to deal with optical transceiver compatibility and all of those problems. 10GBASE-T cabling is backwards compatible with 1G ports which will still be used for things like IPMI and other low bandwidth devices. You could just get one 10GBASE-T switch and connect up everything you have to it. Going with 10G SFP+ makes it difficult to find something that juggles enough of both kinds of ports for all of your 10G and 1G devices. 10G SFP+ is better for future-proof cabling system. You can migrate to 40G QSFP+ smoothly and keep the existing cables. Even OM4 can do 100Gbps up to 150 meters. It is not known if Cat6a, Cat7 or even Cat8 will be able to pull off anything above 10Gb. And this will be stuck at 10G for quite some time. 10G SFP+ interface that has been widely deployed for 10G ToR switches continues to use less power, typically less than 1 W per port. It also offers better latency—typically about 0.3 microseconds per link. While 10GBASE-T latency is about 2.6 microseconds per link due to more complex encoding schemes within the equipment. 10GBASE-T switches are still expensive and there is a very limited choice of those that actually work. Also 10GBASE-T NICs add a premium over 10G SFP+. From a cost perspective, it is cheaper to go the 10G SFP+ cabling since you can find so many used 10G switches for deals, along with decent NICs. In addition, there is more support, driver wise for 10G SFP+ NICs than 10GBASE-T.
By comparison, we find that if flexibility and scalability are more important, 10GBASE-T cabling is a better option; but if power consumption and lower latency are critical, 10G SFP+ cabling may be more suitable. We also find that the cost of 10GBASE-T cabling is no longer in the ascendant. If 10GBASE-T want to acquire an absolute advantage, the primary goal now is to get 10GBASE-T cheaper and more power efficient and bring the cost way down so it can finally replace Gigabit as the next base level networking. 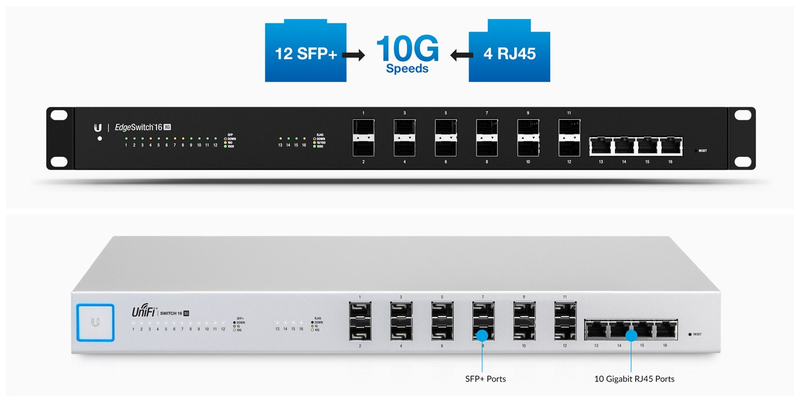 If you do not have to choose vanilla or chocolate, you could have both 10GBASE-T and 10G SFP+ in the same switch, such as Ubiquiti EdgeSwitch 16 XG and UniFi Switch 16 XG. Both of them feature twelve 10G SFP+ ports and four RJ45 10GBASE-T ports to efficiently deliver and aggregate data at 10G speeds. But some people point out that the 10GBASE-T ports on the Ubiquiti switches actually don’t work reliably at 10Gbps speed. Therefore, before you buy it for those four RJ45 10GBASE-T ports, you have to make sure that they can work without issues. Here is a figure of them for you. If you were building out a 10G cabling system from scratch today, which technology would you choose for your 10G network connectivity? Both 10GBASE-T cabling and 10G SFP+ cabling have their own advantages. And both of them occupy an important position in the future of network design and best practices. As for which one to choose, it all depends on your specific need. FS.COM can provide cost-effective solution for 10G network deployment, such as Cat5e bulk cable, 10G SFP+ transceiver, 10G SFP+ DAC cable, 10GBASE-T SFP+ Transceiver and so on. Powering PoE Switch From A PoE Switch: Is It Possible?